Sindh Public procurement management like in most developing countries needs a lot improvement. Laws, Rules and Regulations are non-existent, inadequately implemented or enforced. Capacity and morale of the work force are low whereas, accountability and transparency on need basis. Public procurement practitioners face challenges from both external and internal environments. The former include legal, political, economic and business and socio-cultural environments. The latter is related to three factors: People who make procurement decisions, proceedures which provide a guidance to the practitioners; and controls which ensure probity, transparency and accountability. In order to deal effectively with the challenges an adequate and independent audit mechanism should be formed that manages to balance between the financial and performance audit. In Pakistan current procurement regime started functioning in 2002 when the Government of Pakistan created PPRA at Federal level through a presidential ordinance. The system was strengthened by adding Public Procurement Rules 2004 and Public Procurement Regulations 2008. The Sindh Province adopted the system in 2007 through an ordinance which was under the same nomenclature was converted into an Act 2009. 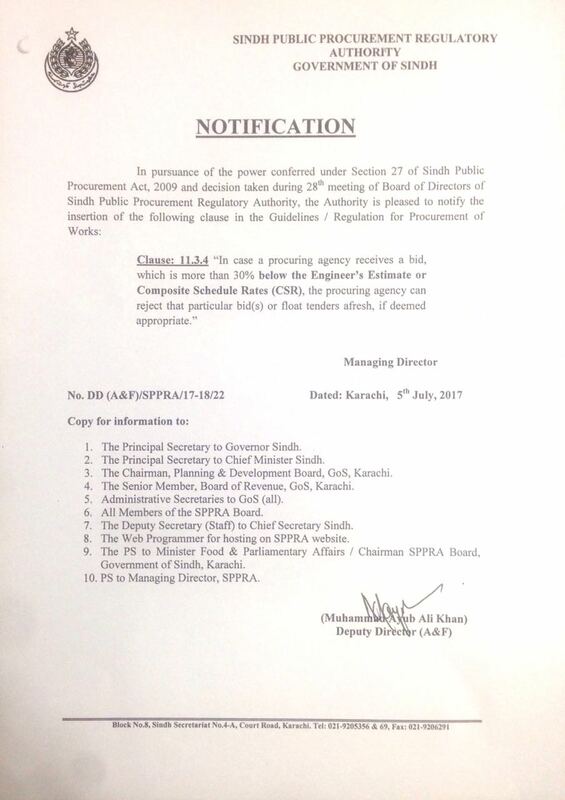 Sindh Public Procurement Rules 2009 (SPPRA-09) were also notified in the same year to beef-up the procurement system in the province. The enforcement of Law/Rules however, remained passive due to absence of proper office of the Sindh Public Procurement Regulatory Authority. The enforcement of any Law/Rule requires its proper awareness and orientation. In order to achieve an extensive capacity building, a programme has been launched ambitting all the Public Sector Organizations down to Town Municipal Administration level. A high power committee under the Chairpersonship of Additional Chief Secretary, Sindh has been constituted to revisit the Public Procurement Laws/Rules so as to bring them inconformity with the Public Sector Organizaion’s Requirements without astraying from the International best practices. Four new procurement related Rules/Documents such as Procurement Regulations, Code of Ethics for Public Procurement, Public Procurement Checklist, Public Procurement Consultancy Service Rules, Draft Standard Bidding Document and Draft Contract Agreement are under consideration with the forum (Planning & Development Department). Increased expenditure and quantum of procurement has created an opportunity for corruption and waste public procurement. In order to vitiate and minimize the chances of the malpractices, the proposed Rules and Regulations have been drafted. The main focus of these Laws would be to ensure transparency and accountability as these are the key inducement to individual and instructional probity, a key deterrent to collusion and corruption, and a key prerequisite for procurement credibility. The salient features of the current procurement system include a regulatory body mandated to monitor the public procurement activities, legal framework elaborating a mechanism as well as procedure on public acquisition of goods, works and services by the public sector enterprises, establishment of grievance redressal/appeal mechanism exclusively for settlement of complaints on the contract management issue, a mechanism for wide dissemination of Government policy decision, procurement opportunities and results of evaluation exercises for award of contracts and regulatory arrangements for ensuring access to information on the public procurement system. Copyright © 2009-2019 Sindh Public Procurement Regulatory Authority (SPPRA), Government of Sindh. All right reserved.